Intuitively, there is an optimal mass for a ball being thrown. If it’s too heavy then we won’t be able to give it a large initial speed. Too light, and it will be slowed down very quickly by air resistance. A shot is too heavy, a tennis ball too light. K will be fixed using the fiducial case of a cricket ball thrown with initial velocity of 120, 140 and 160 km/h. As before, the launch angle is chosen to maximise the range of the throw for a 1.8m tall thrower. The plot shows that, as expected, there is a mass which maximises the range of the throw. It is quite close to the actual mass of a cricket ball (0.16 kg, dashed vertical line) and a baseball (0.145 kg), which is a satisfying result. 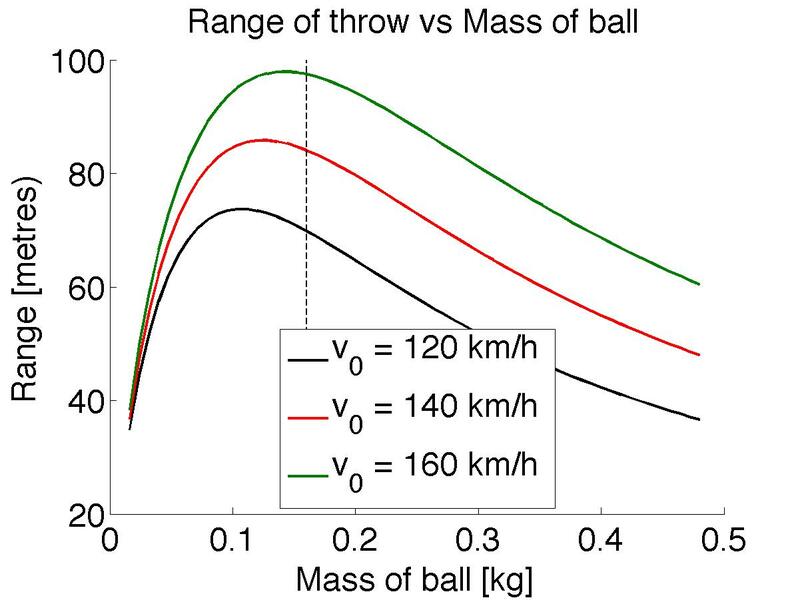 The optimal mass increases slightly with the force applied by the thrower (i.e. the fiducial initial velocity ). Next time: how much easier is it to hit a six (or a home run) at higher altitudes?